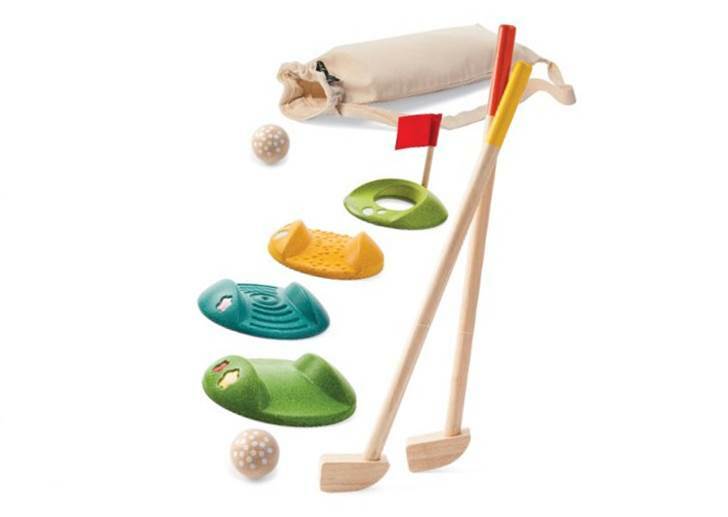 Get your toddler on the path to honing his/her golf swing with the new PlanToys mini golf set. Each set comes with two wooden kids-sized golf clubs, two wooden balls, three different types of challenging tracks and one hole, with a handy storage bag included for easy travel to playdates or tee times. This set is made with sustainable rubber wood and coated with a non-toxic finish, and all colors are made from vegetable dye. Mini kid golf will help your child develop fundamental skills such as focusing on a task, coordination, gross motor skills and of course playing with a friend and taking turns. The set can be used indoors or out.